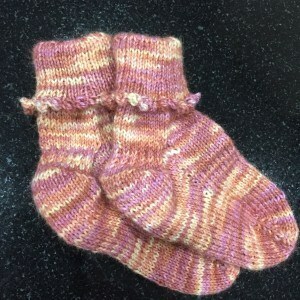 Lately, I’ve taken to welcoming new babies into my realm with socks. I was getting far too behind with blankies and socks really do feel more like Aunt Katie. 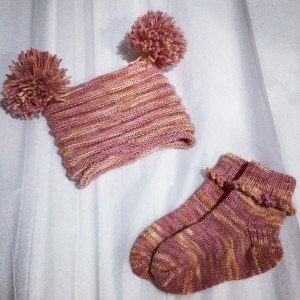 In this case, Mom-to-be picked out some yarn and asked if I could knit something for Baby Girl. I agreed and began to hunt for a hat pattern. 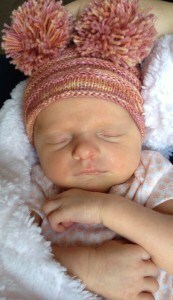 They were considering naming her Penelope at the time and I ran across this hat and this one for a little Penelope. I took it as a sign and cast on. Note: You’re going to want to be careful with ladders on this hat. 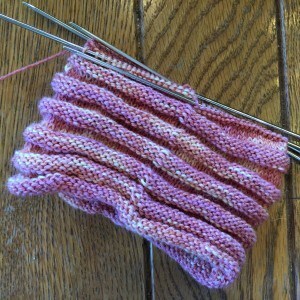 I used 8″ addi DPN’s and the weight of the needles caused some fairly significant laddering. 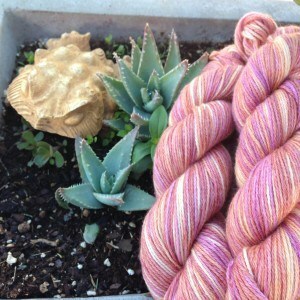 (a better knitter would have noticed this sooner, but it happens to be best of us.) Luckily, the yarn allowed me to block most of it out. I was VERY lucky! 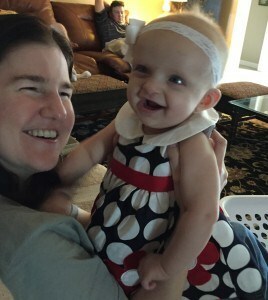 or maybe the universe was smiling on her since she’s turned out to be one smiley little lady. Needles: hmm. maybe 2.25mm circs? Here she is thinking about her next pair of socks.